It’s that moment in the cruise booking process that requires you to select your cabin. You know you want a balcony (or inside or suite) but now you need to choose the specific room you want. The only problem? There are hundreds to choose from all over the ship! How do you know which deck is best, or if you should choose a midship room or one more forward or aft? The truth is, there is no objective answer to the question, “What’s the best cabin placement on my cruise ship?” It all depends on what’s important to you. Whether you need a cabin that won’t aggravate your motion sensitivity or want the best view possible, we round up the locations you should book, based on your stateroom preferences. Cabins at the very front or very back of a cruise ship are most likely to have the best views, as they offer the widest vistas of the ocean stretching out behind or in front of the ship — or in the case of forward cabins, your next port of call. Views are especially fantastic on ships that offer front cabins with oversized floor-to-ceiling panoramic windows. Select Royal Caribbean and Carnival Cruise Line ships fall into that category. Also good for a larger balcony are cabins located on the so-called “hump” of a cruise ship that is designed with a curvy outline. Cabins located where the ship transitions from a narrower to a wider width have angled balconies that are roomier than a typical veranda. Hump cabins can be found on select Celebrity and Royal Caribbean ships. The closer to the edges (top, front and back — but not bottom) of a sea-going vessel you are, the more likely you are to feel the movement of that ship in the water. It’s worst at the front of the ship, which hits the waves first and rebounds upward. (How high the resulting bounce is depends on how rough the water is.) The higher on the ship you are, the more exaggerated the up and down motion of the ship hitting the waves feels. It’s less noticeable at the back of the ship, but even there the motion of the ocean can be felt, especially if the seas are at all rough. Cruisers with a sensitivity to motion will do best midship (midway between front and back) and as low down as possible, as the rocking and rolling of the ocean is much less perceptible the closer you are to the waterline. If you want the quietest cabin possible, eliminate cabins located by noisy areas. Do not book cabins located directly under the pool deck or buffet, too close to the elevators, across the hall from a laundry or crew entry door, and under or over the casino, theater or nightclub. You’ll also want to skip cabins located low and forward (where the anchor being lowered or raised can generate a lot of sound) or at the back (where the ship’s generators create a hum that rarely, if ever, stops). 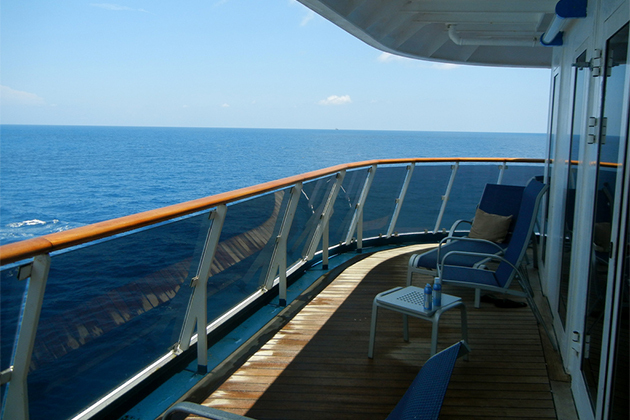 You’ll need to study a deck plan for the best placement or call on a travel agent who knows the ship you’re booking. However, a general rule of thumb is to surround yourself with other passenger cabins — on either side of you, across from you and above and below you. Crowds are the bane of cruisers with any type of mobility impairment, and while you can’t avoid people all the time on a cruise ship, you certainly can choose a cabin in a location that’s easier to navigate to or from. Cabins on decks that also host passenger services or public spaces are usually harder to traverse; there will often be people milling around, blocking the walking area so selecting a deck that only has cabins on it is advisable. Even though the hallways tend to be narrower, there are rarely people standing around. If possible, try to snag a cabin near an elevator so there’s less distance between your cabin door and the lift. If you’re a thermal suite aficionado and plan to spend lots of time in the spa, relaxing on a heated lounger or soaking in the ship’s thalassotherapy pool, you’ll probably want to get a room that’s as close to the spa as you can get. (That way you don’t have to traverse the entire ship in your robe and slippers!) On some ships, you can find designated spa cabins on the same deck as the spa; on others, you’ll probably be one or two decks away. Other ships get you even closer; on Seabourn you can actually get a room with direct access to the spa via a staircase located in the spa’s lobby. On Costa ships, the spa cabins have direct access to the Samsara Spa via a semi-private glass elevator. If you’re a thermal suite aficionado and plan to spend lots of time in the spa, relaxing on a heated lounger or soaking in the ship’s thalassotherapy pool, you’ll probably want to get a room that’s as close to the spa as you can get. (That way you don’t have to traverse the entire ship in your robe and slippers!) On some ships, you can find designated spa cabins on the same deck as the spa; on others, you’ll probably be one or two decks away. Other ships get you even closer; on Seabourn you can actually get a room with direct access to the spa via a staircase located in the spa’s lobby. On Costa ships, the spa cabins have direct access to the Samsara Spa via a semi-private glass elevator. The most obvious room location for any water-lover is as close to the pool as you can get. On some cruise ships, you can get a cabin on the very same deck as the pool, so it’s out your door and a quick stroll to paradise. On other ships, you might have to get a cabin one deck below the pool, adding a minute or two or more to your cabin-to-pool commute. Another, less obvious choice for water babies is a cabin that’s located close to the water line. While you can’t go into the water, you’ll be able to hear it lapping against your balcony or porthole window. For those for whom cruising is just as much about being on water as anything else, these cabins — like the cove balconies on select Carnival ships — are the perfect home away from home.